The charges set out are for customers requiring annual moorings and are effective from the 6th April each year. Invoices rendered and unpaid 14 days after invoice date are subject to a 10% surcharge and if these are not settled after 30 days from the invoice date, the mooring allocated will be forfeit. We reserve the right to alter mooring positions. N.B. These moorings are not for residential use. 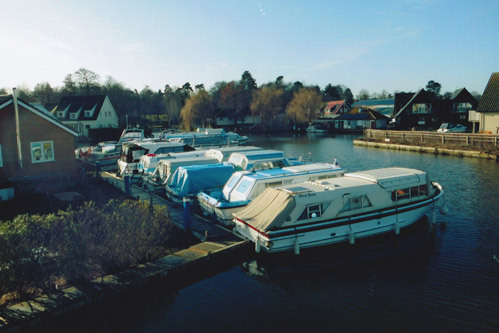 Regular, long term moorings are charged at £61.15 per foot per year plus VAT, stern on, on jetty. Side moorings and those stern on, on the bungalow quay are charged at £64.15 per foot per year plus VAT. Charges are yearly, in advance. Often we are able to provide short term moorings which are charged at £1.00 per foot per week plus VAT. Charges are monthly, in advance. No rebate will be allowed for boats vacating moorings during the season unless the mooring is re-sold by Sabena Marine. There is a standing charge of £25.00 per quarter plus cost of the electricity used plus VAT. At £61.15 per foot, stern on & on jetty. At £64.15 per foot, side on & bungalow quay.